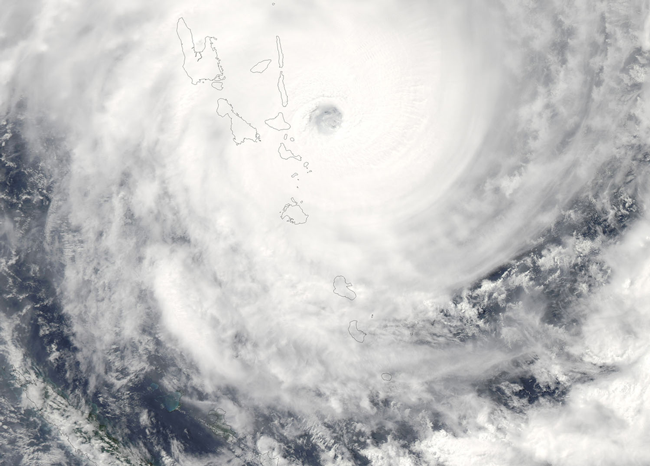 Late on 13 March 2015, tropical Cyclone Pam hit Vanuatu, packing wind gusts of up to 320 kilometres (200 miles) an hour, and causing widespread damage in the archipelago nation located in the South Pacific Ocean. It was the most devastating tropical cyclone that the southern hemisphere has ever experienced, and the worst natural disaster in the history of Vanuatu. Eleven people were reported dead, and many others injured. More than 200 houses were permanently destroyed, and up to 10 thousand people were made homeless. Using its strategic and tactical risk management plans, the Vanuatu Customs and Inland Revenue Department (DCIR) responded immediately in the aftermath of this catastrophic cyclone. The DCIR was part of the National Emergency Operations Centre (NEOC) set up in 2012 in the capital city of Port Vila within the facilities of the National Disaster Management Office (NDMO) – the national coordinating agency for responses to emergencies leading to disasters. Before the cyclone hit, a series of meetings were organized by the NEOC to coordinate the preparedness and responses of Customs and other key border agencies involved in the logistics supply chain. Immediately after the cyclone hit, Customs was again present at the Council of Ministers’ meeting, advising on key strategies and options. A state of emergency had been declared, following the cyclone, by the Head of State and the Minister for Climate Change, calling for fast release of disaster relief supplies coming into Vanuatu. After receiving the state of emergency declaration, Customs was again present at the Bauerfield International Airport to facilitate the arrival of C-17 military aircraft and expedite the release of goods. Customs also participated in multiple logistics cluster meetings with local and international aid agencies, such as the Red Cross, World Vision, Save the Children and Oxfam International, as well as with shipping and airline companies, such as DHL and South Seas Shipping. However, a number of challenges had to be overcome: two Customs vehicles were damaged, causing a set-back to operations; debris of trees and buildings were all over the streets, causing flat tyres to the few vehicles at hand; and fuel shortages across the country limited the use of the vehicle fleet in general. Moreover, Customs and other authorities were hindered in their response due to a communication blackout, resulting in Customs having to revert to manual procedures to allow for the smooth clearance of goods. All records were kept in paper files until the systems were back online, two weeks after the cyclone had hit. Over 1,000 tonnes of relief supplies landed in Vanuatu during and after the state of emergency period. These supplies included tarpaulins, tents, chain saws, building material, seeds for agricultural purposes, planting tools and material, food supplies, health and hygiene kits, water, water tanks, and many other types of supplies. Despite the absence of a Memorandum of Understanding (MoU), good working relationships were established informally between Customs and key stakeholders, such as the NDMO. According to import duty regulations, the Director of Customs delegated powers to the Director of the NDMO to allow for speedy approval of disaster relief supplies. Customs accepted landing orders and cargo manifests to clear goods. However, if goods were found to have been diverted for any non-humanitarian aid purpose, Customs could demand that the importer follow normal clearance procedures and pay any Customs duties owed to the government. All releases of relief supplies were reported back to the NDMO to assist the distribution plans and the monitoring of relief supplies. Import regulations in these circumstances authorized the Director of the NDMO to keep records on importations of such relief supplies. Given Vanuatu’s experience, it is recommended that a formal MoU should be signed between Customs, as the lead agency at the border, and other relevant institutions, such as the NDMO, to allow for more preparedness in order to mitigate the challenges of similar catastrophic natural disasters in the future. Such a MoU would clarify the responsibilities of each agency, define each agency’s specific roles and assignments, set out who reports to who, and contain any other relevant measures. More work also needs to be done to ensure that cooperation mechanisms are in place, and that the staff of the different agencies work as a team to effectively coordinate operations, thereby ensuring the timeous distribution of relief supplies to those affected within a minimum number of days.